The answer to the struggle of what to feed marine predators that require live foods is right under our noses. 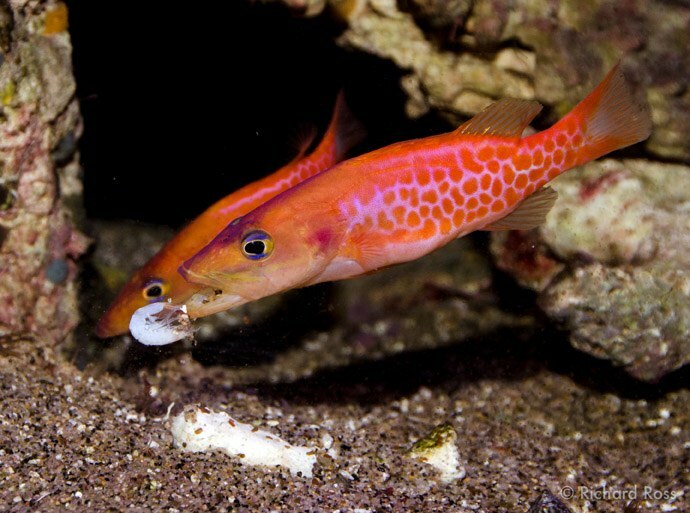 Fish might be friends, but in the real world the may also be food. Back in March, I wrote about Chad Vossen feeding a platinum clownfish that was to be culled to juvenile Dwarf Cuttlefish, Sepia bandnesis, and talked about how clownfish destined to be culled might be a great source of marine feeders for predatory marine animals. As a follow up I present to you the below video: Dr. Seuss eats Nemo. In the video I feed my pair of Dr. Seuss Fish, Belonoperca pylei, some captive bred designer clownfish that were raised in quarantine conditions, and were destined for the culling block. These clownfish were provided to me by Bay Area Reefers President, Steinhart Aquarium Volunteer (Thanks David!) and clownfish breeder extraordinaire, David Sheh. Feeding marine predatory animals can be difficult because finding appropriate live foods can come with all kinds of problems. Availability can be challenging, as finding the right size prey items, in the quantity you need them, when you need them can be problematic. Disease and parasites from wild caught prey items can infect your predatory fish, and quarantine of such animals is and added expense, as well as taking up time and resources. Worse, the ethical issues surrounding wild caught feeder animals are significant; using animals flown halfway around the world as feeders seems exceedingly wasteful. Furthermore, with some aquarium fish potentially to be listed as threatened or endangered in the endangered species act, the practice of feeding out wild caught animals can become even more inflammatory. Cultured freshwater prey items don’t offer a great alternative as they can have a different nutritional profile from saltwater prey items, and can present sub optimal results – for example, in my experience Dwarf Cuttles fed solely freshwater ghost shrimp tend to lay much fewer eggs, and fewer viable eggs than cuttles fed saltwater shrimp. If only there were a whole bunch of captive bred, saltwater animals that nobody wanted, weren’t sellable, and were often culled as a matter of course. Oh wait. There are.